G. A. Taubes, Fortune 17 (April 18, 1988) 90-93. At 28, MacArthur Foundation genius Stephen Wolfram may be the most promising physicist to appear in years. But he aims to get rich as a software entrepreneur instead. Rarely do conventional people produce innovation in business or technology. Almost invariably, innovators have a wild gleam in their eye, metaphorically if not literally—and they can be a real handful to manage. Stephen Wolfram is a case in point. He's been called a child prodigy, and at least as often a problem child. In the words of Harry Woolf, former director of the prestigious Institute for Advanced Study in Princeton—where Wolfram, at 23, was one of the youngest senior researchers ever—he has "a cultivated difficulty of character added to an intrinsic sense of loneliness, isolation, and uniqueness." According to John Gage, science director for Sun Microsystems, which has been supplying Wolfram with computers for five years, he is "totally impatient, antagonizing to everybody, and very smart to boot, so he can be irritatingly correct." The one near-unanimous opinion of Wolfram is that he is very, very smart, what his fellow physicists would call off-scale—having intellectual power that would not register on a smart-o-meter that measures the bulk of humanity. Richard Feynman, the legendary Nobelist in physics who died recently, called Wolfram "astonishing." After Wolfram left Caltech, Feynman said he missed having the younger man around to bounce ideas off, which is how such great physicists as Niels Bohr and Enrico Fermi had used Feynman when he was young. Wolfram had his first scientific paper published in a physics journal when he was 16 and still a schoolboy at Eton. He was the youngest of the original recipients of the MacArthur Foundation "genius" fellowships in 1981 and the only physicist in the group. In his early 20s he pioneered in a field known as cellular automata, developing a theoretical model of how complex behavior—in anything from brains and computers to flowing fluids—can evolve from the interactions of simple, identical component parts. A former colleague once said he was sure Wolfram would win a Nobel Prize; he just had no idea what field Wolfram would win it in. Now, at 28, the cantankerous ex-prodigy says he's had it with science, or at least with the scientific establishment. He has gone into business. For himself. "You look at at these scientists and you see people who did one good thing, and then they just keep on doing it for the rest of their lives," he says. "Right now I could be leading what many people would consider a very happy life, flying around from one conference to another, giving talks, publishing a paper every six months. But I don't want to live that way. It's boring as hell." Instead Wolfram is putting the finishing touches on a new mathematics software program he has created, and has started a company to market it. The software can run on computers from desktop PCs to supercomputers bigger than a refrigerator. Says Gage of Sun: "To bring mathematical notation onto a screen, to be easily manipulated by anyone, is a major step forward. Stephen's program will change practical engineering. It will change the way science is done and the way mathematics is taught. Stephen has a tool that will bring essentially all of applied mathematics to everyone's desktop." Gage, whose company has quickly reached $538 million in annual sales on the strength of its avant-garde approach to technology, puts the number of potential customers for Wolfram's software at well into the hundreds of thousands. That figure takes in the university market, which could include almost everyone in a math course, as well as a share of the four million or so Americans in scientific or engineering occupations—and anyone else who has to rely on quantitative methods for research, such as many economists, political scientists, and sociologists. Wolfram is negotiating deals with major hardware firms, including Sun and, rumor has it, Apple and Steven Jobs's NeXT, although neither company will comment. The computer makers would presumably bundle the program as part of the standard system software they supply with their machines. For those who will not be buying new computers, and with them his program, Wolfram has set up Wolfram Research, Inc. to market a version for every type of machine. He expects that his mathematics software will buy his way out of what he considers the bureaucratic tangles of modern science. "This business about begging for money from the government is for the birds," he says. "Personally, if I'm going to go out and raise money for my research, I much prefer to deal with smart business people who run venture capital firms than with the bozos the government employs to administer funds." is illustrating the solutions to a complex equation in 3-D and living color. Not long after midnight on a Tuesday morning, Wolfram is at the computer in his office at the Center for Complex Systems Research in Champaign, a personal fiefdom bestowed upon him two years ago by the University of Illinois. It is said of Wolfram that he writes computer programs the way others write letters. He can compose at a pace of a thousand lines of code a day—not bad considering that the industry average for programmers is on the order of ten. Now Wolfram is smiling, amiably charming, Ben Franklin glasses hiding not quite midnight-brown eyes. He is dressed in what one of his business associates calls typical British physicist get-up, which in the U.S. might pass for Salvation Army retread. He could be any age from 28 up. Wolfram's usual office hours are from two in the afternoon to six in the morning. If he wants to be free of interruptions he works at home, which is a two-bedroom house outside Champaign. He drives an old Volkswagen Rabbit, a radar detector clipped to the sun visor so he can take the arrow-straight Illinois roads at a bit more than 90—"which," he says, "is about the limit for this car and a possible reason for buying a new one." Something of the aura of a man-child remains about Wolfram. Though he is a full professor and director of his own research center, he admits to having had a phase a few years back when he did what he calls the "whole pseudoteenage thing" of going to rock concerts and dating sorority girls. He hadn't done that as a teenager, he says, owing to "intellectual smuggery," the belief that such entertainment was beneath him. Later, however, he decided that having a little fun helped him work better. Tonight, Wolfram is showing off his program, explaining that it will do, instantaneously, virtually all of applied mathematics, from high school algebra, trigonometry, and calculus to anything that scientists or engineers might dream of needing. It cannot replace the theoretical, abstruse musings of pure mathematicians. But it can take an equation and translate it on the screen into a three-dimensional picture that provides so clear an understanding of what that equation means that a calculator couldn't match it in a thousand years. "It's programmed to run equations like this," he says. "At the most trivial level you just type in, say, 34 times 26." Wolfram is typing away, clickety-click click, his fingers running over the keyboard. The number 884 rolls up on the screen. "Now take three to the power 70." Clickety-click. The screen displays 2503155504993241601315571986085849. He looks over, smiles. Impressed? "How about the square root of ten to 40 decimal places?" Type, type, type. Smile. The screen reads 3.1622776601683793319988935444327185337196. He keeps going, increasingly convoluted formulas scrolling up the screen. Wolfram is smiling again. He is visibly delighted with his handiwork. After a short, meteoric, and volatile career in pure science, he seems to be doing what he wants. Wolfram was born in London in 1959. His father ran an import-export business and wrote novels on the side. His mother was an Oxford philosopher. "I was viewed as a hopeless, crazy child," he says. "My parents concluded that I was 'impossibly psychologically confused and would never get anywhere in life.'" He wrote his first two scientific papers with no help except what he could find in the Eton library and popular science journals. Without bothering to graduate, Wolfram moved on to Oxford and became acquainted, for the first time, with "real scientist types." He entered the university just after his 17th birthday. "The first day I got to my first-year lectures and decided they were really awful," he says. "So I went to third-year lectures, and I found those pretty boring too." He left Oxford, once again without a diploma, and enrolled for graduate studies at Caltech, which had recruited him on the strength of his publications and his burgeoning reputation. In Pasadena, Wolfram worked with some of the best physicists in the world. Once again, he decided he was wasting his time and made motions to move on. "But we tricked him, so to speak," says Nobelist Murray Gell-Mann, who helped to bring Wolfram west. "We gave him a Ph.D." Wolfram was barely 20. The Caltech physicists also awarded him a senior research position to help keep him around. It didn't. Neither did the MacArthur Fellowship, which came at that time and paid him $128,000 over five years. Wolfram simply didn't seem interested in doing what he was expected to do. What had impressed Gell-Mann, Feynman, and most other physicists—at least those whom Wolfram hadn't totally antagonized—was the range of subjects he penetrated with alacrity: high-energy physics, mathematics, cosmology, computing, even artificial intelligence. But they would have preferred him to stick to physics. "Most students are very, very impressed with the beauty and fundamental character of elementary particle physics," says Gell-Mann. "Stephen has a different kind of taste." His next and last stop in mainstream academia was the Institute for Advanced Study, a haven of higher intellection made famous by Albert Einstein and J. Robert Oppenheimer. Wolfram, once again, did not feel sufficiently honored just to be there. When a permanent position that he believed had been promised to him went instead to a young astrophysicist whom he considered less than his peer, Wolfram started casting around for a university that would leave him answerable to no one. Illinois was prepared to do just that, and made the most attractive of the several proposals he was offered. Wolfram now says he finds negotiating a good deal to be at least as satisfying as anything he has done in science. He began making deals early, and he has always been interested in money. He once sold his Eton uniform to American tourists, although he says he can't remember for how much. This nonscientific passion is one of the things his former colleagues always recall, like his addiction to chocolate. ("He ate a million chocolate bars a day," says a former Oxford physicist. "If chocolate causes anything, Wolfram's going to get it.") Says Norman Packard, who works with Wolfram at Illinois: "He's concerned not so much with being rich as with accumulating that kind of power rather than purely intellectual power." 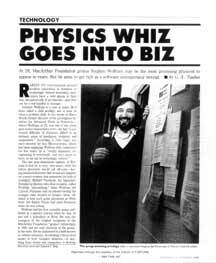 The entrepreneurial bent in Wolfram led him to inaugurate Complex Systems, his own bimonthly scholarly journal, in 1986. "I went around and talked to a bunch of publishing firms, and they all gave me all this stuff about how it's so difficult and blah, blah, blah, blah, blah," he says. "Eventually I said, 'Screw you guys. I'm just going to start it. You know, put $25,000 in a bank account and just start the thing.' It's doing well. It's even making a profit." His applied mathematics software, tentatively called Mathematica—he's not happy with the name—incorporates what is known in the business as a symbolic manipulation program, along with other features. It is the vehicle Wolfram expects to ride to financial freedom. The one constant factor in his life has been his computing; he began programming at 13, writing computer games for his upper-class mates at Eton. He insists he is not what he calls a hacker type. He doesn't play games. (Any games, for that matter. He stopped playing chess when he was 7, after his first loss: "I decided, first of all, that I didn't like losing, and second, that playing games is a big waste of time.") And he certainly doesn't play with computers. This is serious stuff—purely science. At Caltech in 1979, Wolfram decided to concoct a program that would do the mathematics for his work in theoretical physics. He had been using the most popular of the few existing symbolic manipulators, Macsyma, which had been under development at MIT for nearly 15 years. It represented more than a hundred man-years of work, according to Joel Moses, who headed the project. Wolfram was convinced that the world needed a new symbolic manipulator. He hooked up with Chris Cole, a graduate student who was working part time for IBM. He then recruited half a dozen other students, including several undergraduates, and wrote the program in a little more than a year. It was an example of what Illinois computer scientist Stephen Omohundro calls Wolfram's "unbelievable chutzpah, his vision to do things that people just didn't imagine were possible or allowed." The program was a primitive incarnation of what would eventually become Mathematica. It promptly led Wolfram and Caltech into an epic custody battle. Wolfram had written the program and wanted to market it. Caltech administrators insisted that the program had been developed with Caltech money and resources and thus belonged to Caltech, not Wolfram. He left Pasadena in disgust. According to Wolfram, a great commercial opportunity exists for Mathematica. A few years ago the only people who could use such a program were the limited number of scientists using mainframe or minicomputer workstations with access to Macsyma or Reduce, a similar program available through the Rand Corp.
By contrast, Wolfram is shooting for the largest possible clientele. For starters, his program will be able to run on the new generation of personal computers—including IBM's PS/2 line and the enhanced Macintoshes, which went on sale a year ago. That would make them available even to high school students looking for a leg up on their homework. The Caltech program is currently marketed by a Los Angeles company called Inference Corp. for $5,000 to $9,950, depending on the computer. The Mathematica software could cost as much as $100,000 for Cray supercomputers and as little as $200 for the Macs. Any price difference, Wolfram argues, simply reflects the value of the program to the user: "Cray 2 is a hell of a lot faster than the Mac. So it can get much more out of the program. From a practical point of view, if somebody spends $20 million on his computer, he can afford a bit extra for software." Since last fall, Wolfram has been devoting more energy to making deals, which is his continuing passion. He admits to having had to make adjustments for naiveté in his scientific manner of bargaining: His tendency was to enter every negotiation with a deal he considered fair to both sides. Now, he says, "I figure out what's fair, and then I double or halve any numbers and start from there." Recently he's been spending all his time cleaning up the program, writing the manual, and negotiating with hardware firms. "My lawyers are talking to their lawyers" is the kind of thing he's saying. He's also figuring out how to market Mathematica, even working on the final name, which can't sound too threatening for the average high school student or too chintzy for the serious researcher. "It's kind of a frustrating thing," he says. "God, I've spent so long on this, and now I've got all these dictionaries, English to ancient Greek. You know, you sit there reading an English dictionary on a plane and, boy, people give you strange looks." Wolfram's personal goal, colleagues at Illinois say, is to net $10 million from the program. Not only would that make him financially independent, but it should also pay for the design of a powerful parallel-processing computer based on theoretical concepts he developed from his work on cellular automata. That could cost something in the neighborhood of $5 million. Building such a computer would jibe with one of his plans, which is to get into the artificial intelligence business designing a thinking machine. He thinks that field has been saturated with researchers who cannot tell the difference between a good idea and a useful product. But then he adds a caveat: "For all I know, if I succeed at making money, I'll decide that making money is a lot of fun and I should try to make lots more. Although probably I won't. I don't have much to spend it on other than interesting projects." And possibly a faster car.